Despite its multilingual setting, Namibia’s sociolinguistic situation has attracted little attention by researchers at this point. While English has been the sole official language for over 20 years, at least 10 other languages can be encountered in the southern African country, whereas English is seldom acquired as L1. Keyboard-to-screen communication (KSC), i.e. messaging services such as SMS and WhatsApp, is omnipresent in our current daily lives. As the medium fre-quently exhibits elements of spoken language, the language used on WhatsApp can be an interesting source for pheno-mena that often occur in oral language use. 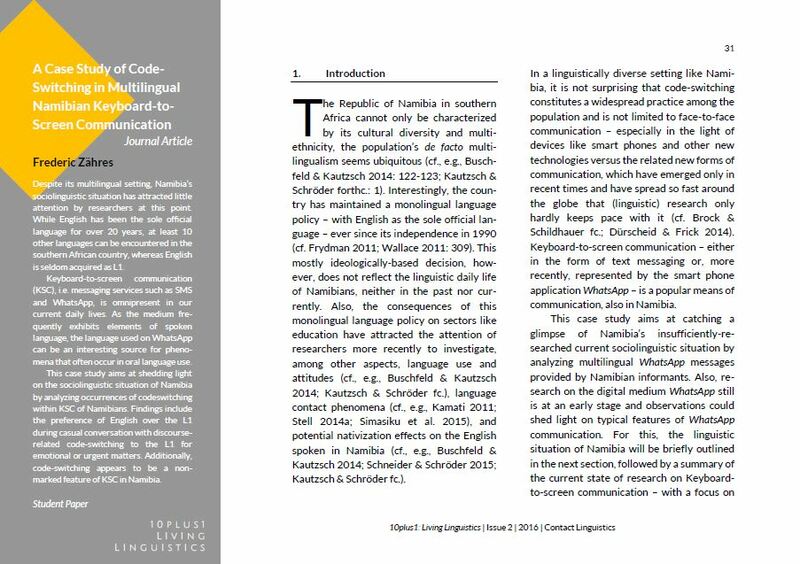 This case study aims at shedding light on the sociolinguistic situation of Namibia by analyzing occurrences of codeswitching within KSC of Namibians. Findings include the preference of English over the L1 during casual conversation with discourse-related code-switching to the L1 for emotional or urgent matters. Additionally, code-switching appears to be a non-marked feature of KSC in Namibia. Frederic Zähres has recently finished his Master’s degree in British and American Studies and will soon start as a doctoral student of English Linguistics at Bielefeld University. His main research interests lie in (socio-)linguistic aspects of computer-mediated communication as well as World Englishes and Expanding Circle varieties of English.